This article is about historical and mythological order. For written text, see Jómsvíkinga saga. For the Amon Amarth album, see Jomsviking (album). The Jomsvikings were an order of Viking mercenaries or brigands of the 10th century and 11th century. They were staunchly Pagan and dedicated to the worship of such deities as Odin and Thor. They reputedly would fight for any lord able to pay their substantial fees and occasionally fought alongside Christian rulers. Although they were Pagan, the institutions of the Jomsvikings in some ways anticipated those of the Christian Knightly Orders of the later Middle Ages. The legend of the Jomsvikings appears in some of the Icelandic sagas from the 12th and 13th centuries. According to the sagas (particularly the Jómsvíkinga saga, King Olaf Tryggvasson’s Saga, and stories found in the Flatey Book), their stronghold Jomsborg was located on the southern shore of the Baltic Sea, but the exact location is disputed by modern historians and archeologists. Most scholars locate it on the hill Silberberg, north of the town of Wolin on Wolin island in modern day Poland. Jomsborg is thought by some researchers to be identical with Jumne, Julin and Vineta, which are mentioned in both Danish and German records from the Middle Ages. Historians still debate the accuracy of the accounts of the Jomsvikings. Since the site of their headquarters has never been conclusively located, confirming the tales of their exploits is somewhat difficult. The location of Jomsborg is a matter of debate in historical circles, due to the scarcity of primary sources. There are no contemporary sources mentioning the names Jomsvikings and Jomsborg, but there are three contemporary runestones. Reference also appears in Old Norse poetry and Lausavísur which refer to their battles. The Saga of the Jomsvikings relates that the Jomsvikings were highly selective in deciding whom to admit to their order. Membership was restricted to men of proven valor between 18 and 50 (with the exception of a boy named Vagn Åkesson, who defeated Sigvaldi Strut-Haraldsson in single combat at the age of 12). In order to gain admission, prospective members were required to prove themselves with a feat of strength, often taking the form of a ritual duel, or holmgang, with a Jomsviking. Once admitted, the Jomsvikings required adherence to a strict code of conduct in order to instill a sense of military discipline among its members. Any violation of these rules could be punished with immediate expulsion from the order. Each Jomsviking was bound to defend his brothers, as well as to avenge their deaths if necessary. He was forbidden to speak ill of his fellows or to quarrel with them. Blood feuds between members were to be mediated by Jomsviking officers. Jomsvikings were forbidden to show fear or to flee in the face of an enemy of equal or inferior strength, though orderly retreat in the face of vastly outnumbering forces appears to have been acceptable. All spoils of battle were to be equally distributed among the entire brotherhood. No Jomsviking was permitted to be absent from Jomsborg for more than three days without the permission of the brotherhood. No women or children were allowed within the fortress walls, and none were to be taken captive. It is unclear, however, whether members were forbidden marriage or liaisons with women outside the walls. There are different accounts for the origins of the order. Gesta Danorum (book 10) tells that a settlement named Julinum was conquered by the King of Denmark, Harald Bluetooth, who gave it to the Swedish prince Styrbjörn the Strong. Harald then provided Styrbjörn with a strong force with which Styrbjörn terrorized the seas. 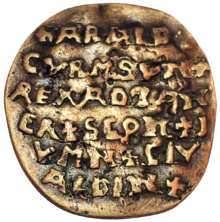 The Knýtlinga saga agrees by giving Harald as the founder of the Jomsvikings, but the story of Styrbjörn is not connected to the Jomsvikings. The Jómsvíkinga saga says that the settlement was founded by Palnatoke, receiving the location from the mythical Wendish ruler Burislav. Styrbjarnar þáttr Svíakappa and Eyrbyggja saga agree with all previously mentioned versions by making Styrbjörn take command of the Jomsvikings after they already had been established. Styrbjarnar þáttr Svíakappa also tells that among the Norse there were many men from the "East land" arriving at Jomsborg, suggesting that it was a settlement of mixed ethnicity. Jomsviking chieftains included Palnatok, Styrbjörn the Strong, Sigvaldi Strut-Haraldsson, Thorkell the High, and Hemeng. 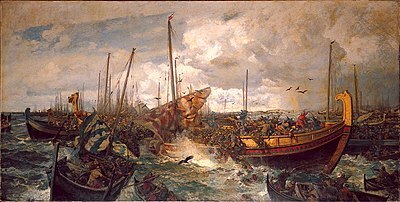 The Battle of Svolder, at which the Jomsvikings fought with Denmark and Sweden against Norway, maybe with a swap of allegiance to side with Forkbeard's advantage, of his 400 ships to Tryggvason's 100. (Otto Sinding painter). Accounts of their size vary. In various sources, Jomsborg was supposed to have held anywhere from 30 to 300 ships in its harbor. However some historians believe Jomsborg was largely a market center with its Danish garrison imposed on the Wends. Gesta Danorum (book 10), Styrbjarnar þáttr Svíakappa and Eyrbyggja saga relate that in the early 980s, the exiled Swedish prince Styrbjörn the Strong brought the Jomsvikings to a devastating defeat against Styrbjörn's uncle King Eric the Victorious at the Battle of the Fýrisvellir, Uppsala, in 984 or 985, while trying to take the crown of Sweden by force of arms. The fact that the Jomsvikings lost was attributed to a pact which the Swedish king Eric made with Odin. Three runestones from this time, the Högby Runestone ("the brave champion Asmund fell on the Fyrisvellir"), one of the Hällestad Runestones, labelled DR 295 ("he did not flee at Uppsala"), and the Sjörup Runestone ("He did not flee at Uppsala, but slaughtered as long as he had a weapon"), relate to deaths with honour at Uppsala, probably three Jomsvikings. The battle is also commemorated, in poetry, by the Icelandic skald Þórvaldr Hjaltason, who took part in the battle on the Swedish side.Jómsvíkinga saga tells that in 986, they attacked Haakon Jarl in Norway and were defeated in the Battle of Hjörungavágr. The saga recounts that Jomsvikings captured by the Norwegians and about to be executed exhibited courage and defiance, some being eventually spared by their captors. The Jómsvíkinga saga ends with a brief explanation of the battle's aftermath and, in fact, points to this battle as the beginning of the end for the Jomsvikings. After these two decisive defeats, the power of the Jomsvikings waned, but Olaf Trygvasson's Saga relates that they played a decisive, if treacherous, role in the Battle of Svolder in 1000. At Svolder, a Jomsviking force led by Sigvald Jarl abandoned King Olaf of Norway and joined forces with his enemies to annihilate his fleet. This action may have been intended to fight the Christianization of Scandinavia, which had been forcibly promoted by Olaf. As it happened though, the Danish king Sweyn Forkbeard, who won the Norwegian throne when the sea battle ended, was (at least nominally) a Christian. He and his father, King Harald Bluetooth of Denmark, are reported to have been baptized in 965. Their decline continued over the next few decades. According to the Heimskringla, King Magnus I of Norway decided to put an end to the Jomsviking threat. As part of consolidating his control of Denmark, he sacked Jomsborg, destroyed the fortress and many of the inhabitants were killed in 1043. A golden disc bearing the name of Harald Bluetooth and Jomsvikings stronghold seat Jomsborg appeared in Sweden in autumn 2014. The disc, also called the Curmsun Disc, is made of high gold content and has a weight of 25.23 grams. On the obverse there is a Latin inscription and on the reverse there is a Latin cross with four dots surrounded by an octagonal ridge. The inscription reads: "+ARALD CVRMSVN+REX AD TANER+SCON+JVMN+CIV ALDIN+" and translates as "Harald Gormsson king of Danes, Scania, Jomsborg, town Aldinburg". It is assumed that the disc was a part of a Viking hoard found in 1840 in the Polish village Wiejkowo near the town of Wolin by Heinrich Boldt, the maternal great-great-grandfather of Hollywood actors and producers Ben Affleck and Casey Affleck. Jomsvikings are the focus of E. R. Eddison's novel Styrbiorn the Strong and Horned Helmet a juvenile historical novel by Henry Treece. Fictionalized versions of the Jomsborg (under the name "Jormsvik") and the Jomsvikings appear in Guy Gavriel Kay's novel The Last Light of the Sun, which is set in a fictional world that closely parallels 9th-century Britain and Scandinavia. In Tim Severin's Viking series, Thorgils spends time amongst the Jomsvikings, although they are a smaller, older, and weaker force. The legendary Jomsburgers also appear in Creative Assembly's Medieval Total War Viking Invasion expansion pack, though they are called Joms Viking. They are the most highly skilled warrior available to the Vikings. Jomsvikings appear in Thrones of Britannia, another Total War game where they are one of the best units available to Norse-civilization factions. The short story The King of Norway by Cecelia Holland, in the anthology Warriors, has at its center the story of the Battle of Hjörungavágr. In the manga Vinland Saga by Makoto Yukimura, several of the main characters are based on Jomsvikings from the Sagas, such as Thorkell the High and Canute the Great. The manga depicts them as an elite force under Sven and then Canute during their invasion of England, while trying to keep their waning influence on the court. It is also said that the protagonist Thorfinn's father, Thors, was a Jomsviking until he became a pacifist, fleeing Jomsborg with his wife. This led him to be considered as a traitor and, slain by Askeladd's band. In The Old Gods DLC for the Paradox Interactive PC game Crusader Kings 2 the Jomsvikings serve as a Norse pagan version of the Christian holy orders. Jomsvikings are central characters in The Deepest Sea by Charles Barnitz. In the 2003 Polish film An Ancient Tale: When the Sun Was a God by Jerzy Hoffman, Jomsvikings are portrayed as marauders in the service of the main antagonist Popiel. Swedish melodic death metal band Amon Amarth released the album Jomsviking in 2016. The album tells a story set in the world of the Jomsvikings. ^ N. F. Blake (1962). "The Sagas of the Jomsvikings" (PDF). Thomas Nelson and Sons. Ltd. Retrieved October 22, 2015. ^ Jones, Gwyn (2001) A History of the Vikings 127; Otto Kunkel (1941) Jumne, Vineta, Jomsburg, Julin, Wollin. ^ Władysław Duczko. "Viking-Age Wolin (Wollin) in the Norse Context of the Southern Coast of the Baltic Sea" (PDF). Heimskringla, The Chronicle of The Kings of Norway. Retrieved October 26, 2015. ^ For the historiocity of the Jomsvikings and the Saga of the Jomsvikings; for a discussion of different views on the subject, see Jones 127 at n.1. Jones regards the Saga as fictional, but finds arguments that the Jomsvikings themselves could not have existed unconvincing. ^ a b Eyrbyggja Saga § 29 (Palsson 83). ^ Svend Ellehøj. "Olav Tryggvesons fald og Venderne". Historisk Tidsskrift. Retrieved October 26, 2015. ^ Snorri Sturluson. "Saga Of Magnus The Good". Heimskringla, The Chronicle of The Kings of Norway. Retrieved October 26, 2015. Hollander, Lee M. (1989). The Saga of the Jomsvikings. University of Texas Press. ISBN 978-0292776234. Jones, Gwyn (2001). A History of the Vikings (2d ed.). Oxford Univ. Press. ISBN 978-0192801340. Kunkel, O.; K.A. Wilde (1941). Jumne, Vineta, Jomsburg, Julin, Wollin (in German). Stettin. Palsson, Hermann (1989). Eyrbyggja Saga. Penguin Classics. ISBN 978-0140445305. Sturlason, Snorre (1990). Erling Monsen (ed.). Heimskringla: Or the Lives of the Norse Kings. Dover Publications. ISBN 978-0486263663.